This photo the globular star cluster Messier 55 was taken by a European Southern Observatory telescope, and shows tens of thousands of stars swarming together. A ball of some of the oldest stars in the universe looks like a swarm of bees in a new view from an observatory in Chile. The photo, released today (May 9), was taken by a European Southern Observatory telescope and shows 100,000 stars crowded together in Messier 55, a globular star cluster located roughly 17,000 light-years from Earth in the constellation Sagittarius (The Archer). 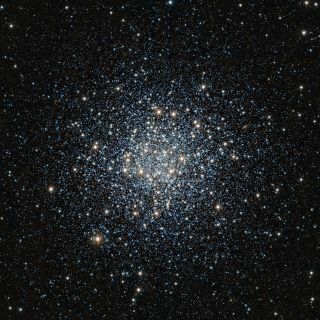 It is one of about 160 globular clusters orbiting the outskirts of our Milky Way galaxy. Scientists suspect the stars in globular clusters formed from single clouds of gas that condensed to make stars around the same time, around 10 billion years ago. That makes these stars some of the most ancient known. As such, they provide valuable archaeological evidence about what the universe was like not long after the Big Bang is thought to have given rise to it. "As this formative period was just a few billion years after the Big Bang, nearly all of the gas on hand was the simplest, lightest and most common in the cosmos: hydrogen, along with some helium and much smaller amounts of heavier chemical elements such as oxygen and nitrogen," scientists with the European Southern Observatory wrote in a statement. Astronomers estimate the universe is about 13.7 billion years old. In contrast, our own star, the sun, formed only 4.6 billion years ago, and is made of more complex, heavier elements that were around at this later epoch. The new image was taken at the 4.1-metre Visible and Infrared Survey Telescope for Astronomy (VISTA) at the Paranal Observatory in Chile's Atacama desert. The cluster Messier 55 (also known asNGC 6809) is easily visible through a small telescope, and stretches about two-thirds the width of the full moon across the sky. It was first observed in 1752 by French astronomer Nicolas Louis de Lacaille, and later added by another French astronomer, Charles Messier, into his famous catalog of bright objects.